Jesus accepted the literal history of Genesis. This is clear from His quote of both Genesis 1 and Genesis 2 in the same verse, and referring to this time as “at the beginning” Matthew 19:4-5 “4And He answered and said to them, “Have you not read that He who made them at the beginning ‘made them male and female,’ 5and said, ‘For this reason a man shall leave his father and mother and be joined to his wife, and the two shall become one flesh’?” Given Jesus was there at the beginning (John 1), may we all accept His testimony as true. The Bible is the history book of the world. We should believe it! The following chart illustrates the lineage from Adam to Jacob/Israel based on the Hebrew Masoretic Text. 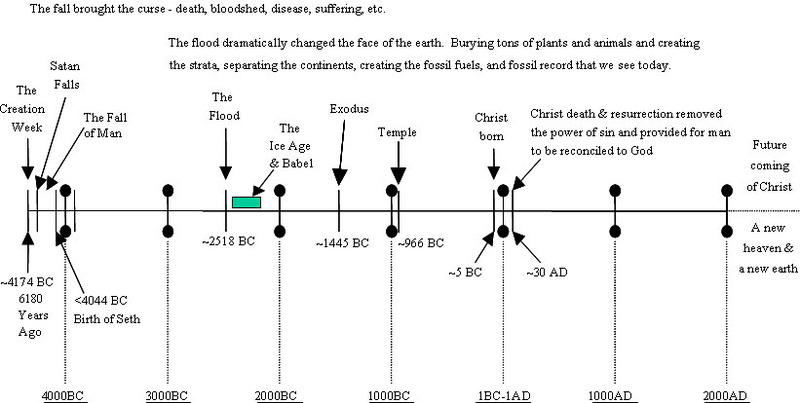 The split occurs at the time of the flood so as to be able to clearly show the lineage before and after the flood. Note that AC refers to the number of years After the Creation week.